"This is just a discussion that we wish we were having over tea and coffee in someone’s living room. There would probably be kids yelling in the background. There would probably be cookies, and spilled tea." Feel free to join our virtual tea party by chiming in with your own advice, input, or anecdotes (we love anecdotes) in the comments. 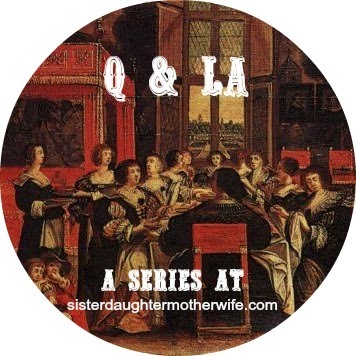 If you want to send us questions for a later addition of Q and LA, you can add them below in the comments or e-mail them to sister-daughter-mother-wife (at) googlegroups.com. I grew up Lutheran, but I have various friends from other Christian backgrounds. In the past, I just overlooked the differences between churches, but as I've learned more about Lutheran theology, I've become more aware of the heresies taught in other denominations. I know that the church is invisible and that my friends aren't necessarily going to hell because they like being in the Methodist or Roman Catholic church. I also know that only God can convert the heart. I guess I'm just looking for advice for those moments when I find myself with an opportunity to explain the value of Lutheran teachings and end up failing to find the nice balance between soundly condemning the heresies and showing patient love and polite consideration. Is there anything I can say or do, or should refrain from saying or doing, that would make it more likely for a non-Lutheran Christian to consider the faults of the theology their church professes? One of the simplest but most profound things I have learned about such situations is how powerful it is to show a deep, honest interest in others’ doctrine. If it is possible, I prefer to start by asking my friend to explain his or her position; often it turns out that I held certain incorrect assumptions about my friend’s beliefs or at least misunderstood where the emphasis lies within those beliefs. Then, like Paul at the temple to the unknown god, I can find a point of connection to start explaining my own beliefs, and we are much more likely to engage in a discussion than a lecture series. I also find that, regardless of their denomination’s official position, most Christians respect the Bible as an authoritative source, so delving into the Word of God together is worthwhile. I can point out that I believe __ because the Scriptures say __, and this often allows my conversational counterpart to respond with an alternate interpretation of the passage or to gain appreciation for my perspective. Most important, I think, is the attitude with which such conversations are approached. In my Lutheran middle school classroom, usually about half the students are of other Christian denominations, and this can provoke deep and serious discussions about doctrinal differences. Thirteen-year-old boys can sometimes become quite heated, and I advise them what I also remind myself frequently. In such conversations we should proceed by “speaking the truth in love” (Ephesians 4:15). Both aspects are necessary: speaking the truth and doing it in love. Speaking the truth haughtily wins no converts, but neither does “lovingly” remaining mute. When discussing apologetics with my class, I remind them of the old saw that it does no good to win the argument but lose the friend. Far better to plant ideas that may blossom and bear fruit in years to come than to root out heresy but leave behind bare and empty soil. The most important thing you can do is keep the conversation focused on Jesus. And keep calm. Jesus is the center of Lutheran (and Christian) theology. Pretty much all of the significant denominational differences can be summed up in our attitude toward Jesus and the work that He has done for us. This means avoiding “rabbit holes” where we argue about things like which hymnal Lutherans should be using rather than talking about the content of the hymns. When things are constantly related back to Jesus, it is easier for you and your conversation partner to see the relevance of the discussion. Heresy comes into tighter focus when held up to Jesus. So ask questions like: How does this false teaching obscure Jesus? How will this idea keep me from giving Jesus 100% credit for my salvation? How will this teaching direct my faith away from Christ? What does the Bible really say about this? Talk to others who have converted from another denomination to Lutheranism, and ask them for their reasons. Ask them which doctrines or conversations really made Jesus come into sharper focus for them. Remember to go back to what the Bible actually says, not what makes sense to us. There is a time and place for well-reasoned arguments, but the reason we believe something is because God has revealed it in His infallible Word. Immerse yourself in God’s Word on a regular basis. Let it shape and form your theology and understanding of your new life in Christ. The Holy Spirit works when and where He chooses. As you speak to your friends about Jesus, the Spirit is at work, but at His own pace. He may not change your friend’s mind immediately. It might take years. 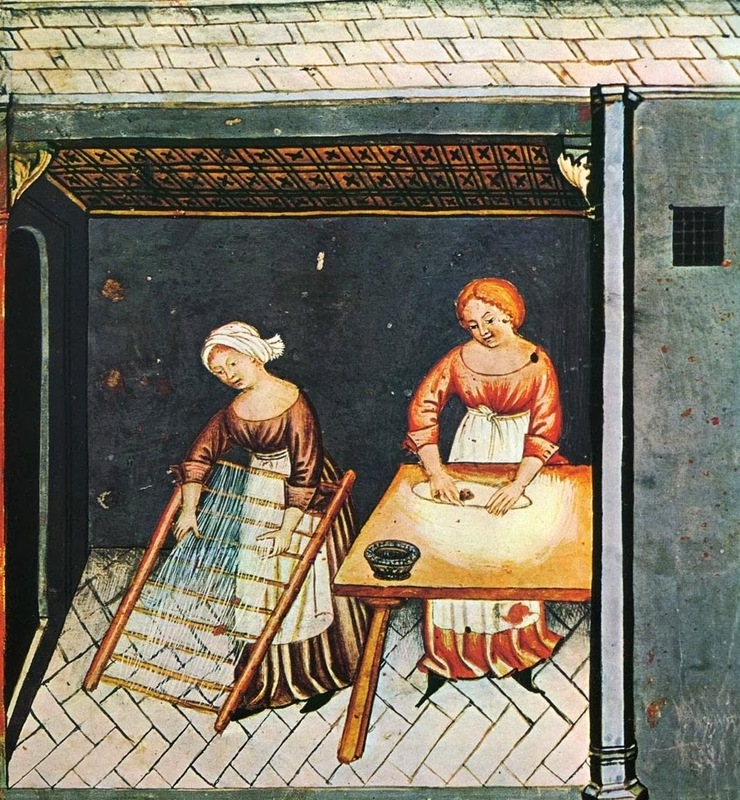 And while they may never convert to Lutheranism, they may take more seriously the theological differences between churches and think more clearly about the work of Christ. Remember that God is the one who changes hearts through His Word, allows us to keep calm in these discussions, and not get impatient with our fellow Christians. 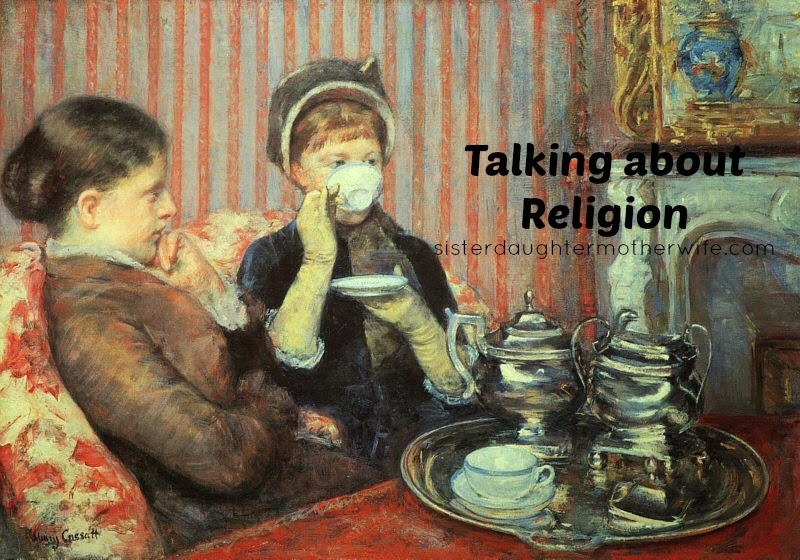 I’ve had many theological conversations with non-Lutheran family members that end in yelling and tears. If and when conversations get intense, be prepared to repent of any heated statements, and communicate that the reason you think this so important is because Jesus is so important. Remember, and this is the most important thing, that everything we say in these conversations is for the sake of love. It is not about being right or winning an argument or sticking it to the other person. We want our brothers and sisters from other denominations to have a clearer picture of who Jesus is and what He has done. This alone will strengthen their faith. When I told my mainstream Protestant friends that my family and I were becoming Lutheran, they knew that we had gone crazy, because Lutherans baptize babies, and that makes us almost as bad as the Catholics! In the eyes of most of my friends, being Lutheran is pretty off-the-wall. Yet many of them have grown to accept the idea that maybe we aren't crazed heretics after all. When conversations come up, it has been helpful to respond to their theological concerns with my position by pointing to the Bible. I can say, "Yes, we baptize babies. Does God mention an age limit in the Bible for faith? Where in the Bible do you find this 'age of accountability'? Didn't Christ say to baptize 'all nations'? Who gives faith to the Christian-- God, right? Couldn't He give it to a baby?" As they realize that my theology comes from an interpretation of Scripture, they become less afraid of it. Throughout the years since, a number of our non-Lutheran friends have ended up joining our church. Their growing interest in attending church, in learning more about God and the Lutheran confessions, and in wanting to be catechized has always come about in the context of long-term relationships with our family. We invite people to dinner. We throw crazy costume parties. We serve food. We organize paintballing excursions. We act super normal and non-crazy, and provide people with friendship, community, and a place to stay when they need it. We certainly don't harangue them or ask that they all be properly baptized before we will serve them dessert. Because these people have relationships with us, they are able to ask questions at their own pace and on their own terms. They are able to see how our faith influences our lives. They are able to hear the conversations about religion that come up naturally, and they get invited to Bible studies and other church activities. Sometimes they come. If you want your friends to consider Christian, Lutheran theology, often the best way to share with them is by being someone they want to talk about God with. Be their friend. Conversions are long-term processes (and in God's hands, not ours), so in the meanwhile, bake these Protestant friends of yours some cookies. That's what Evangalicals call "lifestyle evangelism." This is such a good question! And great answers. When I was 12, we moved into the heart of the Bible Belt. Some people actually believed that Lutherans were not Christians and were going to Hell because of infant baptism, and would tell you that to your face. So I kind of got a little patter down about "What makes a person a Christian?" and we would discuss faith in Jesus, and believing the Bible, and so on. Good practice! But it got tiresome sometimes.